Back/Forward: When you open a page and move to a second page (or third or fourth), the Back button takes you to a previously visited page. Remember that you need to go back before the Forward button will work. Show/Hide Sidebar: Click this button to see your Favorites, Reading List, and Links in the Sidebar, and then click it again to hide the Sidebar. Search or Enter Website Name: This field, to the right of the Show Sidebar button, where you type web addresses, or URLs (Uniform Resource Locators) that you want to visit. Just type one, and press Return to surf to that site. To the right of the Search or Enter Website Name field are two more buttons. Keep reading. Share: When you find a page of interest or a page you know you’ll want to remember, click this button (which is actually a drop-down menu) to tell Safari to remember it for you in El Capitan’s cool Reading List or as a bookmark. Or send a link to it via Mail or Messages, or post it on Facebook or tweet it on Twitter. Show/Hide All Tabs: Click the Show/Hide All Tabs button to see previews of all your open tabs (which you’ll learn about shortly). If you have other Macs or iDevices, you’ll also see the open tabs in this copy of Safari on other devices that have Safari enabled in iCloud. This feature is so handy you can also find it in the View menu, where you’ll also spy its handy keyboard shortcut, Command+Shift+. El Capitan introduces the concept of pinned tabs, which persist in the tab bar until you unpin them. To pin a tab, choose Window→Pin Tab or right- or Control-click the tab and choose Pin Tab from the contextual menu. To unpin a tab you’ve pinned previously, reverse the process and choose Window→ Unpin Tab or right- or Control-click the pinned tab and choose Unpin Tab. But wait — there’s more. To add other useful buttons to your toolbar, choose View→Customize Toolbar (or right-click anywhere on the toolbar and choose Customize Toolbar from the contextual menu). The Customize Toolbar sheet drops down, and you can drag items into or out of the toolbar to create your own custom set of buttons. Here, for example, six new buttons are added to the toolbar (left to right): Top Sites, Favorites Bar, AutoFill, Zoom In/Out, Mail, and Print to my toolbar. 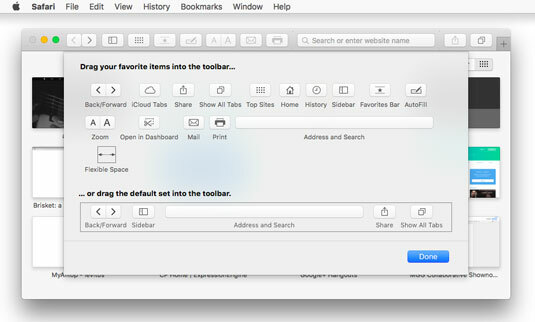 The Customize Toolbar sheet and customized toolbar. Web addresses almost always begin with http://www. But Safari has a cool trick: If you just type a name, you usually get to the appropriate website that way without typing http, ://, or www. If you type apple in the Search or Enter Website Name field and press Return, for example, you go to Apple. Or if you type boblevitus, you’re taken to The BobLevitus.tv Show. Try it — it’s pretty slick. Below the Search or Enter Website Name field is the Favorites bar, already populated with some buttons of web pages Apple thinks you might enjoy, including Apple, Yahoo!, Google Maps, YouTube, and Wikipedia. If you don’t see your Favorites bar, choose View→Show Favorites Bar or press Command+Shift+B. All buttons on my Safari toolbar are actually drop–down menus, as denoted by the little chevron after their names, as shown here. All the buttons in the Favorites bar are actually drop-down menus. You can delete these bookmarks and/or add your own bookmarks to the Favorites bar (and Sidebar). 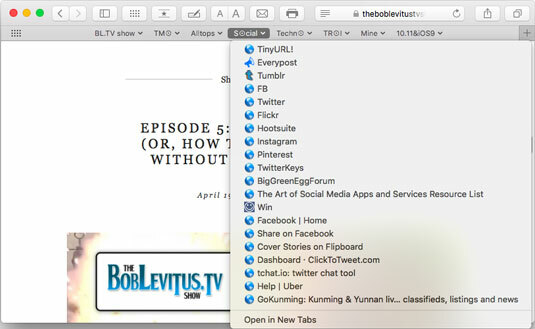 One last thing: Favorites and bookmarks are not exactly the same in El Capitan. Favorites are a folder of bookmarks that appear in both the Favorites bar and in the Favorites view (if you click Favorites in the Show All Tabs view). You can see your Favorites folder at the top of the Bookmarks list in the Sidebar. And, perhaps to confuse matters, you can change what displays in the Favorites view (but not the Favorites bar) via a setting in Preferences’ General pane. It can be a trifle confusing at first, but you’ll get used to it.